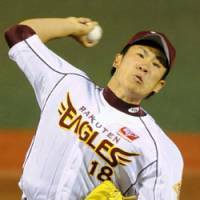 SENDAI (Kyodo) Tohoku Rakuten Golden Eagles right-hander Masahiro Tanaka continued his stellar start to the season on Wednesday, throwing a three-hit shutout in a 2-0 win over the Chiba Lotte Marines. Tanaka (3-0) struck out seven and walked three en route to his third complete game and second shutout of the season. 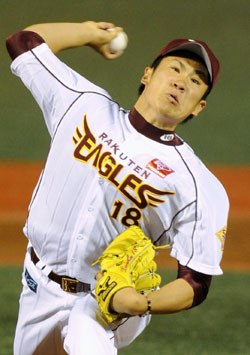 With the win, the Eagles regained first place in the Pacific League. Tanaka’s battery mate, Motohiro Shima, broke a scoreless tie with a two-run single in the seventh off Shunsuke Watanabe (0-2), who also went the distance at Kleenex Stadium. At Osaka’s Kyocera Dome, Greg LaRocca capped a five-run first with a three-run homer as Orix held on to beat Seibu. At Tokyo Dome, Hiroki Kokubo hit a go-ahead two-run homer in the eighth inning as Softbank beat Hokkaido Nippon Ham for its fourth straight win. At Saga Prefectural Stadium, Hayato Sakamoto hit a go-ahead two-run double in the eighth inning as Yomiuri edged Tokyo Yakult to extend its winning streak to five games. At Yokohama Stadium, Masato Akamatsu hit a tiebreaking solo homer with two outs in the top of the ninth as Hiroshima beat Yokohama. At Nagoya Dome, Kazuhiro Wada and Kei Nomoto drove in two runs apiece as Chunichi handed Hanshin its third consecutive loss.